Picture this: 20,000 people waiting in line for over four hours. But, in this scenario, the people stay upbeat, excited, and thrilled throughout the entire wait, even though they are standing and it is hot outside, with not much shade at all. This is the setting I found myself in on Friday afternoon, from 1:00-5:00PM. The line outside Madison Square Garden went at thirteen blocks total at one point, and yet every single person there was thrilled to be waiting in line, and walking one or two steps every ten minutes or so. What can cause such an atypical line to form? Only one thing that I can think of- Pope Francis visiting New York City! We waited in line, and saved each other’s spots when restroom trips had to be made, and got to know the other people around us (One woman even bought all of standing around her bottles of water!) simply because we were on our way to the chance of a lifetime- a chance to experience our typical weekly mass in a way none of us had ever experienced it before. View of the entire altar. Everyone told me- and I knew quite well, that I was heading in to the experience of a lifetime. I was thrilled as I stood in line, meeting James– the autistic 15-year-old who was having the same experience his Mother had when she was fifteen, and the youth minister– who directed everyone across the roads. She even lost her spot along the way several times just to keep everyone safe. I met many people in line, so many amazing, inspiring people; each with their own story and background. A great experience – before I even managed to get through the very intense security in the doorway of Madison Square Garden. I got into the Garden at 5 pm, just in time to see the final performer, Harry Connick Jr., sing my all-time favorite church song: “How Great Thou Art,” which immediately put me in what I considered to be the “right mood” for the event. But I did not need any help getting in the right frame of mind. The instant the Pope entered the arena (in a golf cart, no less) and I caught my first glimpse of him, I was completely blown away. 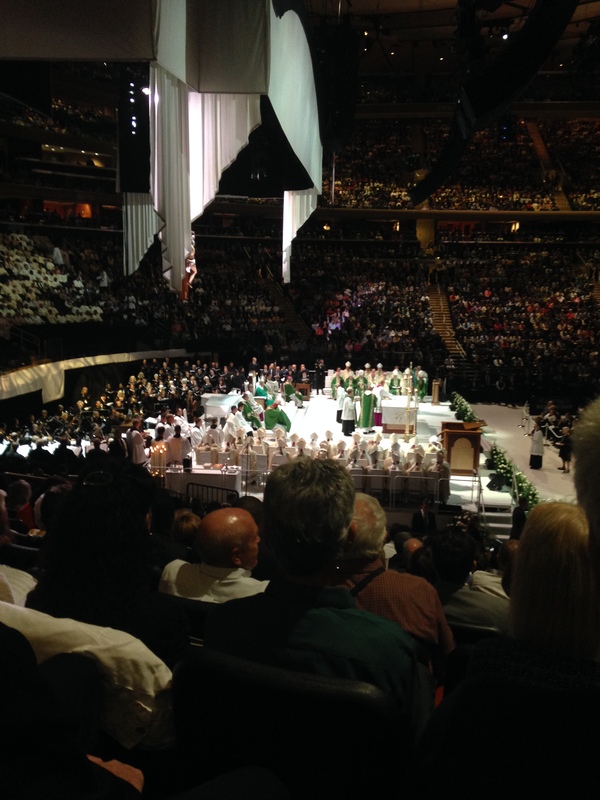 I knew it would be an amazing experience, and I knew I would feel the presence of God, but I had no idea just how incredible the feeling would be until the Pope actually entered the arena to the exuberant cheers of 20,000 Catholics. 20,000 people- five Cardinals, 33 Bishops, and over a thousand priests celebrated the mass along with the Holy Father; located on and behind the altar, and the people ranged from seats directly in front of the altar, to seats that seemed to be just about in the ceiling. During his Homily, Pope Francis spoke about helping those who cannot help themselves, who are invisible, but who walk among us in our cities. He said “Knowing that Jesus still walks our streets, that he is part of the lives of his people, that he is involved with us in one vast history of salvation, fills us with hope”. It was very inspiring to all in attendance, as Pope Francis’ Homilies usually are, it was delivered in Spanish, which seemed to help him get his points across a little easier than he is able to in English. There were several times throughout the mass when it was apparent to me just how much God was present in that stadium, and several times when I, like many others around me, was moved to tears by the sheer awesomeness of God’s presence in that space. But the most amazing and moving moments for me were both right at the end of mass. The first was when Cardinal Timothy Dolan (Archbishop of New York) stood up to speak to Pope Francis. He said; “”At every single mass, every single day we pray for, and in union with, Francis our pope and now here you are.” And the crowd went crazy. Everyone rose to their feet, cheering and applauding as loud as we could for our Pope; the head of our church. The applause went on for over a minute, and the energy and love that filled the room at that point was completely unparalleled. God was clearly there with us through Pope Francis, and each and every one of us in attendance, at that very moment, expressed that we were very aware of that fact.